Today is Friday and your period was due on Monday. Here you are again – a pregnancy scare, guaranteed to be a sobering moment for any couple in love. Dating sure is hard in the grown up world. Too early to confirm or deny the suspicion, you wait a few more days before you fork over the ten bucks and pee on the stick. You still hope it’s stress that’s taken your period hostage. “Stop thinking about it and it will come,” you keep repeating the mantra. Every bathroom break, a hopeful wipe results in colorless toilet paper; a deep sigh accompanies every flush. You move one step closer to a decision you are not ready to make; to a discussion you are too scared to have. You see an intersection on the horizon but you don’t want to reach the crossroads. You could be pregnant. Everyone has been in this predicament at one point. Maybe you’ve been with your partner for a few months; maybe it’s been a few years. But if you still call it dating, an unplanned pregnancy translates into pregnancy SCARE. Its only four days late, you think. But already your body is flooding with premature emotions, multiplying exponentially with every bathroom break, any movement down below. Your dormant imagination goes wild; hypothetical scenarios spill out of you like prolific prose. You create mental flow charts for every option. All in response to the big WHAT IF? You start to question everything – life, your relationship, your values. Conflicting emotions fill up the pros and cons columns, but resolutions like this are often not made by comparing points on paper. You send yourself on an emotional roller coaster, the for it versus the against it, playing bumper cars in your mind. 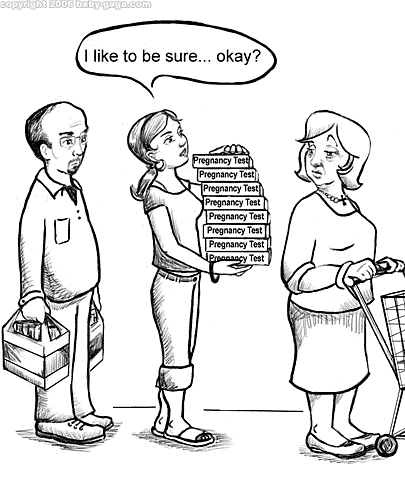 You do all this before you even take the pregnancy test and you’re not sure. In this black and white situation, you see many gray options and often they reveal themselves in the most unexpected places. Your brain is not always the judge in this court; sometimes choices like this are guttural, instinctual, a tugging you cannot logically articulate. Another day goes by but it’s only Saturday and you’ve vowed to give it until Monday before you take the test. You try not to think about it; you distract yourself. You realize that this is just one of a series milestones in a relationship time line; the meeting of the parents, the first vacation, the major sickness, a death of a loved one, perhaps. Now comes the pregnancy scare. You turn crisis into opportunity and use this as a pseudo relationship “check.” Like a secret shopper, you judge your partner’s behavior as you spew out one theoretical after another. You study his performance and file it away for future reference. You judge him but don’t tell him. He may surprise you or he may disappoint you. He may do both. You make a decision. You change your mind. You go back to the original decision. You doubt everything. You go to the bathroom and see a welcome friend. Yep. Well put. I went through this just last week, actually, and I was deeply surprised about my hypothetical decisions and what I felt and thought about the whole thing once it was close to home. Previous Previous post: Happy Virus Appreciation Day!